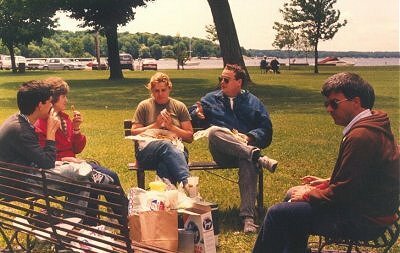 Me and my relatives in a Lake Geneva park, having lunch. TSR's 1989 product catalog lies on my lap. Jeff Grubb and his wife Kate Novak met us there for lunch. We spoke about their book, various other TSR issues (such as the Ravenloft setting and censorship/controversy issues), and they told me that most of the fantasy characters they and other TSR writers create are typically named after friends and relatives. Kate then signed my copy of Azure Bonds. 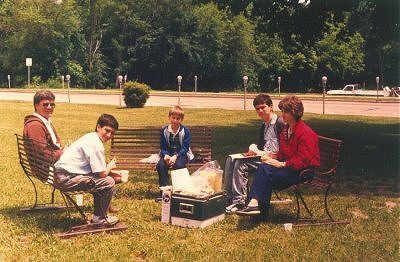 When we were finished luch, they walked away down the steet with their arms around each other. Thus concluded my highly enjoyable time with Jeff Grubb.